Hopefully everyone is enjoying the recipes! If you have any requests just email us or send us a comment. Every recipe I post I try for myself so I can give you some tips and write what I think of them. Trust me - I have tried things that have tasted gross! And those things I will definitely not post for everyone to try. So if you have any requests just let us know! These cookies have a little surprise in them! Great to take for a Christmas plate of cookies for someone! They are easy to make and are do fun and delicious in the middle. Mix your shortening, eggs, and cake mix together. Lightly spray your cookies sheet. Before placing spoonful’s of dough on your cookie sheet wrap a Rollo inside. Bake at 350 degrees for 11-12 minutes and let them cool on a wire rack. Enjoy your surprise inside! 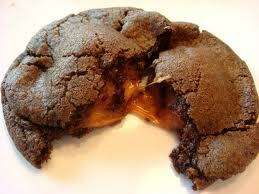 The Rollo melts and so you have a chocolaty carmel goodness inside!